We wondered what would happen when two hawks moved into a tree at the crow’s nesting place along the beach. The crows had owned that tree grove for years. Would the hawks gradually wipe out the crows? Would they eat the young? The predators perched on the top of an evergreen tree slightly higher than the hardwood trees that held the crow nests. They seemed to mock the crows, emitting their high-pitched hunting cries. The predators’ shrieks scattered the crows and sent them frantically searching for lower limbs, flying out over the water, or seeking shelter in other clumps of trees. For days, the crows appeared frantic and frazzled to have predators as unwelcome neighbors. We can’t be sure of what happened. We weren’t there. 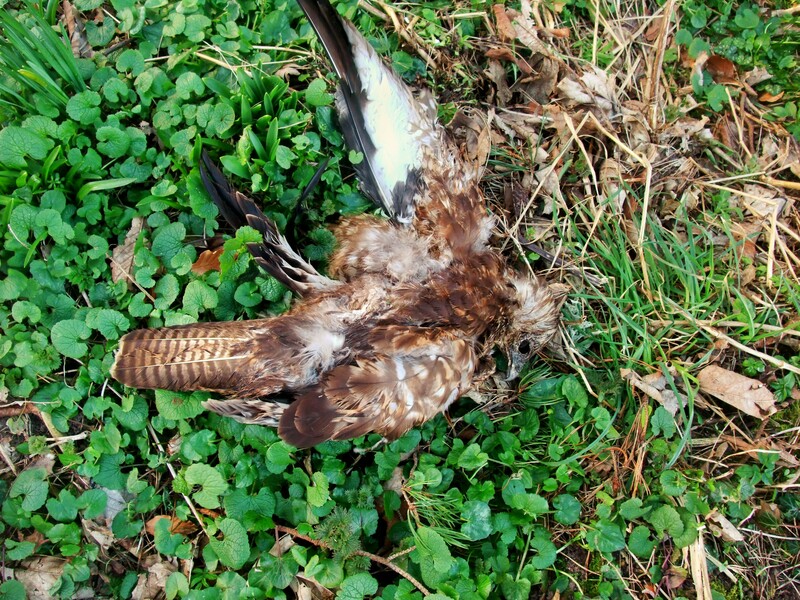 But we found one of the hawks on the ground. It was dead. From the wounds on its back, it appeared that the crows had grouped together and attacked it. Then the other predator left and the crow grove regained its peace–if rousing crow “caws” can be called peaceful! That’s a good lesson for Christians. Satan is real. He’s God’s enemy and he’s your enemy. He came to steal and kill and destroy. He’s a ruthless, heartless predator. He will hunt you. He will mock you. When you knowingly and deliberately engage in sin, you give him permission enter your life. But here’s the good news. Stand up to him in the power of Jesus’ name and he will flee! When Christians bind themselves together in love and prayer in the name of Jesus, they have the victory. Every time. W e have the power to put Satan under our feet. We can render him as harmless as the dead hawk. Posted on March 26, 2013 by authorstephanieparkermckean •	This entry was posted in Uncategorized. Bookmark the permalink.